Note: Visit the Using Website Page to get the most out of this site. In this example we will show how to create fades between images and how to fade to black. We will use the files in Example 5 to illustrate this. The files associated with this example may be downloaded by clicking on the download icon. The files are contained in a self extracting .exe so simply click on the downloaded file and the test files and resulting SWF file will be loaded into your selected directory. Click on the Download Icon to download the Example 6 files. Detail The Detail image of the Timeline shows Fade Marker (green triangle) on the Timeline. A fade is created by grabbing the Fade Marker with the mouse and dragging to the desired length of the transition. Step 2 In this step we stretch the Fade Indicators to create the transition of the desired time. The Stage and Viewer images are not altered. Fade transitions are not visible if the movie is previewed in motion in the Viewer. To create a transition the viewed image is rendered by creating the appropriate weighted average between the two pictures. Many PCs will not have the CPU power to show the render in real time. So rather than show a possibly jerky preview the effect is omitted. The effect may be seen by advancing the Timeline with the "+" and "-" keys. 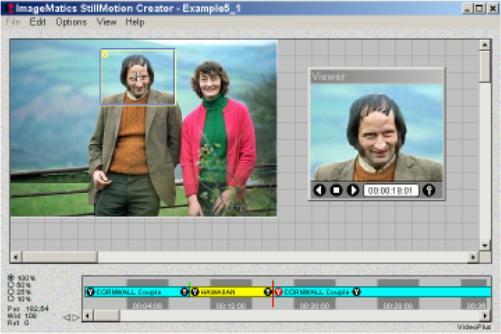 This provides a slow frame rate but allows for frame accurate viewing and editing of Fades. Step 3 Create the Flash Movie as in Example 1 by Selecting the Make Flash SWF Movie entry under the File Menu. See Example 1 Step 4 for details. Figure 3 is the result. We Won't be winning any awards for this one. Compare this with the Movie created in Example 5 without any transitions. Adding fades is almost a mandatory step. Edit the transition times and look at the results long transition times convey a different feel than short ones. Getting familiar with the the impression of different transition lengths will help you make more compelling Movies.